I know you’re looking for the one diet that fixes it all instantly. Unfortunately, everyone’s body is different. And. . .every SIBO patient’s internal bacterial environment is different and will therefor respond to foods differently. Also to be considered are underlying and overlying conditions in addition to SIBO that can create food reactions such as Irritable Bowel Syndrome, food intolerance, autoimmunity, and others. The main target for any SIBO patient is to eliminate foods that rapidly ferment in the gut. These are the sugars, starches and fibers. But, what most people don’t realize is that even some meats have a high enough sugar content, or are difficult to digest due to other issues, and that they too can produce symptoms. This is a technique used to find out which foods you are sensitive to. You start by eliminating everything from the diet that causes you any symptoms of bloating, belching, abdominal distention, pain, gas and all of your other lovely SIBO presentations. This process should take days to weeks, but in a short amount of time, you should see significant improvement in your belly. And remember, what you eat today may not create problems for you until tomorrow or the next day or the day after that, so don’t assume you’re okay with a food just because you don’t have an immediate reaction. 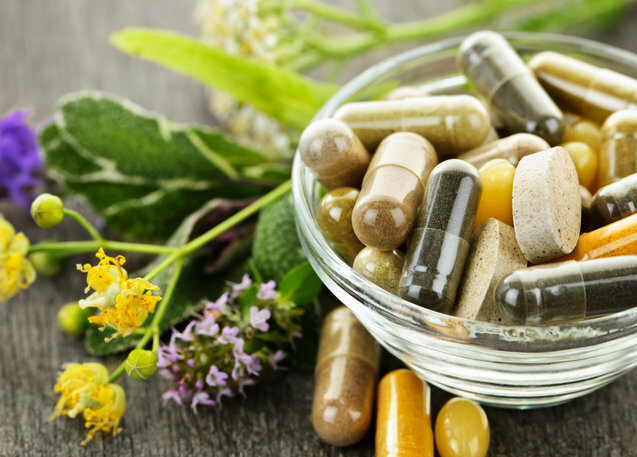 Once you have been on a consistently symptom-free eating plan and used any recommended supplements, you will be instructed as to when it is safe to begin adding foods back, one at a time. If at any time a food causes distress, immediately remove that food, even if it is on the safe list. 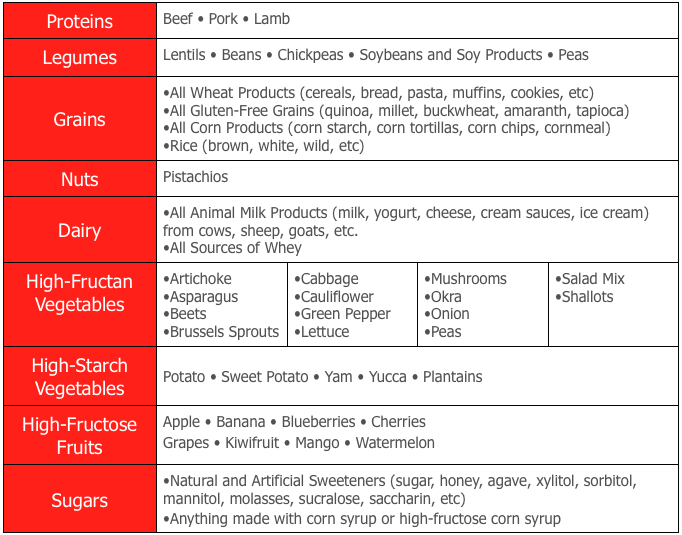 It is recommended to avoid the following foods in each category. This is in an attempt to avoid fermentation and irritation in the gut. This is not an exhaustive list, so use your good judgment. If it probably isn’t okay, don’t eat it. Don’t you just love maybe? You can look at this two different ways. You can be irritated that I cannot definitively tell you whether or not you can safely eat this foods, OR. . .you can be hopeful that they fall into the Safety Zone for you. 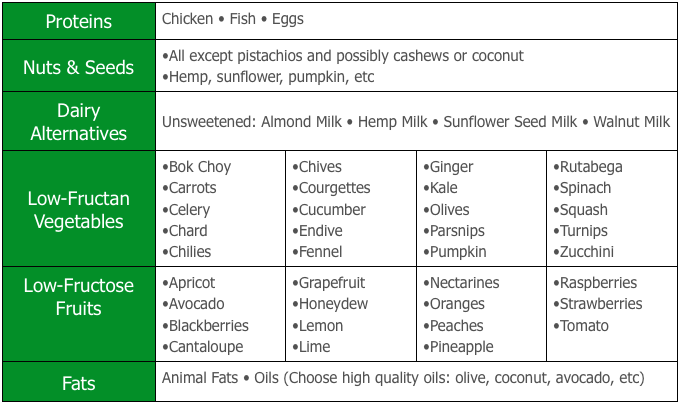 This is not an exhaustive list, but these are the commonly eaten and relatively well tolerated foods that I can confidently recommend to the SIBO population. However, if you eat a food that does not agree with YOUR body, please eliminate it, at least during your healing phase. 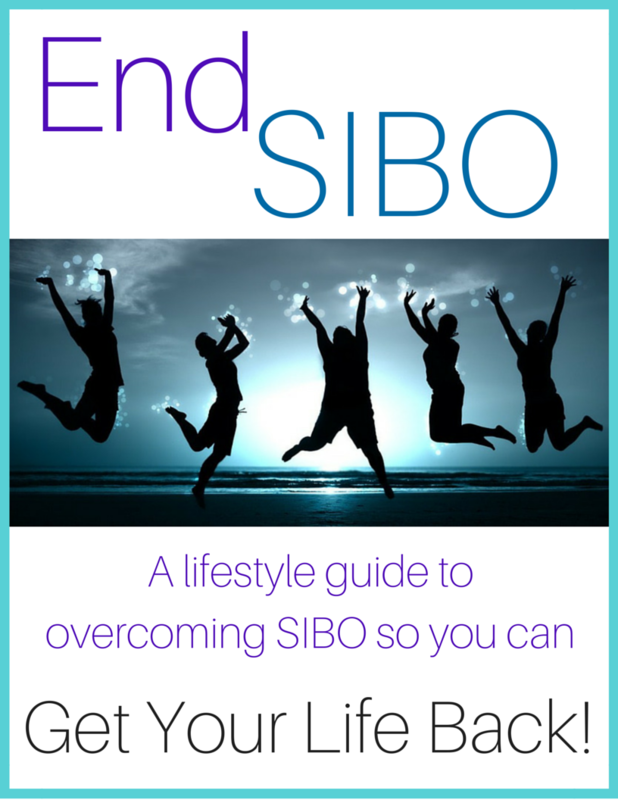 Don’t miss out on all of these Tips for Success which can be found in Dr Lisa’s EndSIBO eBook: A Lifestyle Guide to Overcoming SIBO so You Can Get Your Life Back! Your free copy will be on its way right away, just Request it Here. It really must be stated clearly that diet alone may be enough for you to see symptom relief. HOWEVER. . .this will not eradicate your SIBO. You will still have bacteria that is growing out of control in your small intestine if you fail to properly support your system so your body can restore itself to health. From there, your condition may continue to progress and your body may begin to suffer in other ways such as adrenal fatigue, immune deficiency, nutritional deficiencies, just to name a few. I cannot say this enough. 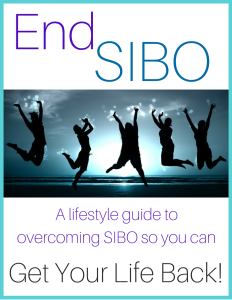 Please see the article How to Overcome SIBO: A Three-Sided Approach. Hi Lisa – do you subscribe to avoiding Polyols, per the FODMAP diet? As I understood it, avocados (a high Polyol food) are problematic for reasons that FODMAPs are not directly absorbable (mono, disaccharides) but rather only broken down via fermentable by bacteria. By the same reasons, Fast Tract diet says dextrose (& other fastest carbs) would be ok because the human body would absorb the sugars rapidly rather that let them be food for bacteria. Granted, this assumes Candida is not an issue. Hi Martin, great question. Thanks so much for asking. I’ve seen patients do quite well with avocado. Maybe it’s because it’s typically eaten as more of a condiment so smaller quantities are consumed at one time. The bigger concern, in my opinion, is the fat content in avocado. If the patient has impaired fat digestion it can cause GI distress. As for polyols, I highly discourage the xylitol, sorbitol, mannitol, etc varieties when used specifically as isolated sweeteners. I know that many GI docs out there consider the fruits with these higher polyol contents to be problematic. And it is true that some patients simply cannot tolerate them at all. I have found watermelon and apples to be the most common offenders with grapes coming in right behind. However, peaches have historically been well tolerated, at least among my patient population, even though they are considered high polyol. So it really comes down to this: I encourage everyone to restrict their food selection down to the point that bloating and GI symptoms have stopped. Then, after giving the body some time to heal, add back one food at a time, spacing new foods about 3 days apart. If anything provokes the GI tract, it must be eliminated until further healing has occurred, at which point that food may be tested again. First I want to thank you for sharing your knowledge in SIBO and other GI disorders. I wanted to ask how do you deal with patients who have become intolerant to a large amount of foods and can barely eat anything without having an reaction. Where do they start? Hi Kia, thanks so much. Your comment means a lot. I make every attempt to empower people through education and helping them sort through all of the information out there. To answer your question, there are multiple approaches I might take, depending on the overall condition. I don’t do cookie-cutter protocols where conditions get compartmentalized and everyone gets the same approach, so it’s hard to answer. I look at each patient individually and prioritize as best as I can. In general, I see this happen with gut permeability, so I’d want to work on supporting the gut wall by microdosing and titrating up on which ever supplement I choose, while simultaneously (if tolerated) supporting the liver and clearing out the antigen-antibody complexes and other toxins that are complicating the situation. I might do anything from a targeted mild cleanse to a deep full-body detox to open up the channels of elimination. That seems to help a lot. Then maybe follow with some immune modulation if needed. There are Specialized Pro-resolving Mediators (SPMs) that I’m considering incorporating now too, to see if that changes things for people on the inflammatory signaling level. I’m always looking at the physiology and my mind is always working on how to approach things better and better. Great question! Some people can easily tolerate onion and/or garlic powders, but it is still recommended to avoid them, at least initially. These ingredients are sometimes hidden in prepared foods, so it’s definitely something to watch for. There are a few things to keep in mind relating to this topic. For one thing, this diet is only a starting point. Many people with compromised digestion, such as in SIBO as well as other GI conditions, have lost what we call Oral Tolerance. This is when the immune system has become so dysregulated that the person’s body begins reacting to foods in a number of possible ways. That being said, even though a food may be listed on the allowed list, it is really up to the individual to test it out and see if it is tolerated. The only way to know is to do what’s called an Elimination/Provocation diet. This is where you clean up the diet until you achieve a relief of symptoms (whether that be abdominal bloating, histamine responses, diarrhea, etc). Then, adding foods back in slowly, one at a time, will give you an indication as to which foods are triggers. Those should continue to be eliminated for the time being. Secondly, diet alone will not eliminate SIBO, but it can provide some much appreciated relief. It is necessary in the healing process because if food is constantly causing inflammation or immune triggers, the entire system will be under continual stress. When under stress, it will not heal. So, I always combine the diet with a comprehensive supplement approach to support overall digestion. This is individualized to the patient. Some people require digestive enzymes, some need motility support, others benefit from botanical antimicrobials, some need to detox the gut, the list is really extensive and everyone is so very different. To answer your question about how quickly patients tend to heal and when they can begin incorporating foods back in on a regular basis, you’re absolutely correct that it is different for everyone. My goal is always to do as much as I can for everyone to assist in healing so they can add foods back in because limited diets actually begin to work against you after a while. It depends on the severity of the overall GI dysfunction to begin with, but I’d say it can be anywhere from a few months to well over a year before people can easily tolerate a wider variety of foods. And in my professional opinion, what many people consider food is not actually food at all. By food, I am referring to food that grows in the ground. . .fruits, vegetables, legumes, minimal grains, even meats. But processed foods that are full of what I refer to as “food-like-substances” probably shouldn’t be consumed by any of us on a regular basis and in fact contribute to gut dysfunction. Hi again, Dr Lisa! I’m curious what your take on bone broth is for patients dealing with SIBO? Do your recommend it? Thanks! Well, it’s a very involved condition so I would need a full work up to really offer advice. I am glad you are starting to see some relief. HCl, pro kinetics, gall bladder support and then gut repair after your breath test comes back clean are all aspects I look at with my patients. Best wishes for full recovery!